Hey K-drama fans! We know how fun it is to be able to watch Korean dramas and understand what’s going on without subtitles, so we’re going to help make that happen. We’re going to cover some of the most common Korean phrases that are used in dramas. We’ll give you the phrase and the meaning. If the phrase has multiple parts, we’ll break them down for you. Then, as you watch your favorite Korean dramas, you’ll start to notice these phrases appear. If you keep doing this, soon you’ll be watching dramas without subtitles! If you can’t read the Korean Alphabet yet (highly recommended! ), there’s a free guide below that will teach you in about one hour. Certain phrases appear in dramas more often than in other formats. Also, certain slang words become popularized by their use in a drama and have since become a more common part of everyday Korean conversation. For example the word 미생 (incomplete-life) was originally a term used in the Korean game 바둑 (Go!). Now it has become a popular word to describe the Korean office environment thanks to the drama (and manhwa) of the same name. 1. 장난해 – Are you kidding me? This expression could be a statement or a sarcastic question. This is often used among friends of the same age or to someone younger. This means ‘are you kidding or ‘are you kidding me?’ In Korean dramas, you’ll never hear this being said to someone older or someone holding a higher position than the speaker unless the person means to be rude. This is an expression Koreans consider as Konglish. This means ‘call’ or ‘deal’ and is used when you are up for the challenge or when you are agreeing on something. We usually hear this phrase in romantic comedies or romance dramas. A person says this when he or she wants to hide his or her true feelings or intentions. But this phrase can generally be used when you don’t want others to misunderstand or misinterpret you. The word 오해 means ‘misunderstanding.’ The word 하지마 from the polite expression 하지 마세요 means ‘do not.’ If you want to sound polite then you may say 오해 하지 마세요. 6. 이렇게 – Like this? This expression can be used in many different situations. It is used when a person just got something he or she wants, won the jackpot, or when a person feels lucky. In dramas, we often hear this when the character is agreeing to another character’s ideas and opinion. It means sure or of course. And sometimes, it can also be used at the beginning of a sentence that indicates condition. It can be used to mean if so, and then. This phrase is usually used when you want another person to wait for you. It literally means ‘for awhile’ or ‘wait for a while.’ You can add 요 to it to be polite then that would be 잠깐만요. Another variation of this expression is 잠시만요. 어쩔 건데 means ‘what are you going to do?’ Again, this may only be used towards a person really close to you or someone of your age and to a person younger than you. It would sound rude and impolite when used to a stranger and to an older person. This question can be heard in dramas when the characters hear some strange sound or they hear a sudden noise. 무슨 is another form of 뭐 and 무엇 that means ‘what.’ The word 소리 means ‘sound’ and 이게 means ‘this.’ So, when you hear a strange sound and you want to know what it is you may ask 무슨 소리야 이게. This is a common expression you hear in Korean dramas which is expressed when a person doesn’t know how to do something. Sometimes, it is also used to express empathy to another person. This phrases consists of the verb 하다 (to do) + 지마 (command to not do something). 하다 + 지마 = 하지마. It is a shortened version of 하지 마세요. This phrase is heard in dramas a lot, along with 가지마 (don’t go). It is often said in a pleading tone by whichever character is getting dumped in that particular episode. If the other person doesn’t respond to the speaker’s ‘하지마’, then he or she will keep teasing the speaker. Then the next line out of the speaker’s mouth is often ‘하지말라고’. The 라고 ending is one of the many ways to use reported (indirect) speech in Korean (along with 다고, 자고, and 냐고). Using these endings is a little bit tricky and requires some study, so just learn this phrase for now. Often part of the drama plot will involve somebody lying, and eventually being found out. The word 거짓말 means lie. 이야 is the standard informal ending for nouns. Combining the word ‘lie’ with the phrase ‘don’t do’ results in 거짓말 하지마. This expression is also very common in dramas. 19. 죽을래? – Do you want to die? In this phrase, it is added to the end of the verb 죽다 (to die). However, you can also use this ending in other situations such as 뭐 먹을래요? (‘What do you want to eat?’). Often in dramas, somebody will have to meet at a café with somebody they dislike. Usually, this person is an evil mom trying to bribe her in an attempt to stop her from seeing her son. If one person is leaving first, then in informal situations he or she will sometimes say 나 먼저 가 or 나 먼저 갈게, both of which mean ‘I will leave first’. Read about how to use this phrase properly here. 21. 그래? / 진짜? / 정말? – Really? When somebody finds out some exciting gossip, then he or she will almost certainly say one of these three words. All of these words mean ‘really?’ in English. They are all used with about the same regularity as the next so learn them all and use them to sound more natural. You might also hear them with a 요 at the end, such as 그래요, 진짜요, and 정말요. 22. 세상에! – What in the world!? This phrase is used to show disbelief. It is often used by the character playing the evil old man who is surprised that he hasn’t been shown the proper respect by the main character (despite his repeated attempts to ruin said character’s life). When used in normal Korean, 안 돼(요) means that something is not allowed. For example, you could say 수영하면 안 돼요 ‘Swimming is not allowed’. However, in dramas, it is often said by the female character (speaking to herself while crying) just after being dumped. She is literally saying ‘he is not allowed to leave me’ as she can’t believe that she got dumped. 24. 사과해 / 사과하세요 – Apologize! In dramas, people are constantly asking each other to apologize for trifling things. The other person then refuses to apologize for those things, leading to the two people ending the episode apart. The verb ‘to apologize’ is 사과하다. The ending -세요 in this context shows that you are asking somebody to do something. The fact that the word is a homonym for the Korean word for ‘apple’ hasn’t been lost on the cheesy Korean scriptwriters who use this terrible pun on a regular basis (for example, in 꽃보다남자). 25. 너 미쳤어? – Are you crazy? From the verb 미치다 (to be crazy), this phrase is used on a regular basis in dramas, As this is one of the more rude Korean drama phrases that you will hear, be careful in real life as people will find you very rude if you say this phrase to them. Often said under someone’s breath, this word is made up of 미친 (crazy) and 놈 which means ‘person’. However, it has negative connotations. It can be used with other adjectives such as ‘나쁜놈’ too. Often used by the whiny rich girl who is a love rival of the main female character. 줘 comes from the verb 주다 (to give), and is the informal way of saying 주세요. If you use this expression, be sure to use your most whiny voice possible. 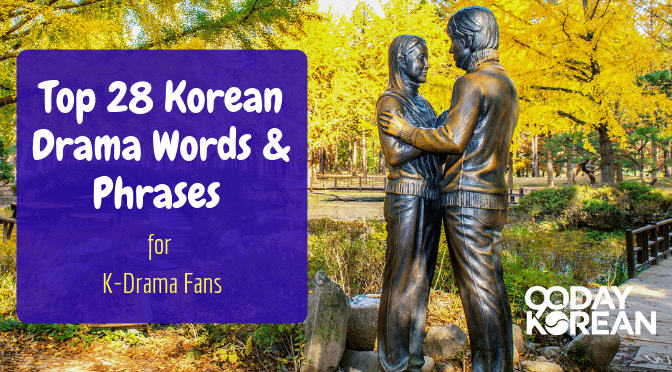 Learning these Korean drama phrases will help with your understanding of Korean dramas. Keep at it, and you’ll be watching them subtitle-free in no time! What is your favorite Korean drama phrase?